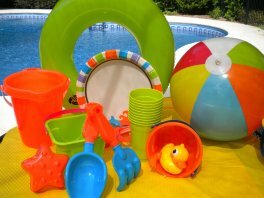 Kids pool party ideas can be theme based or just filled with some fun pool games and good food. 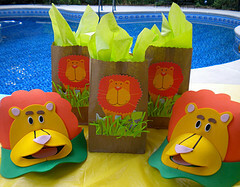 Pool party themes for kids help to give direction to the invitations, decoration, cake and party favors. The theme depends on the ages of the guest and whether it will be girls only, boys only or a mixed group. A Little Mermaid party can become an Under the Sea party for boys and girls. Our Butterfly Party turned into Bullfrogs and Butterflies. 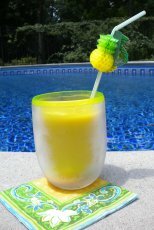 Here are real pool parties that we've hosted with real ideas that are simple, fun and inexpensive. 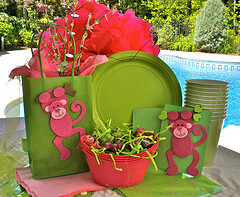 A jungle party theme appeals to girls and boys. Brightly colored parrots decorate the pool gate, snakes hang from the arbor, and kids go on safari in the back yard. Lions, and tigers and bears Oh, My! 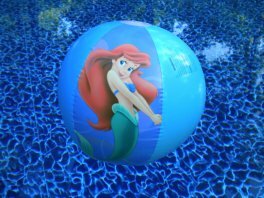 A kids beach party at your pool starts with a beach ball invitation on stock paper or actually written on a beach ball that has been deflated. Serve fruit kebabs and sandwich cutouts for food. Goldfish in a bucket lined with a colorful napkin can serve as a snack for hungry swimmers. Send the kids home with party favors in a little sand bucket. Dancing dolphins greeted guests when they first arrived for our dolphin birthday party. But they weren't the only dolphins at the party. 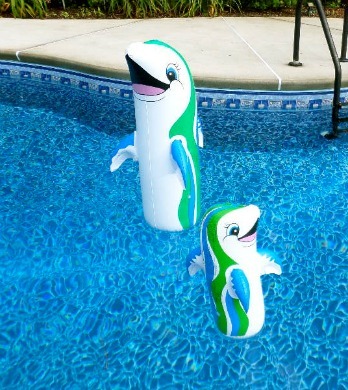 Dive to the bottom "of the sea" and swim with the dolphins with this kids pool party idea. 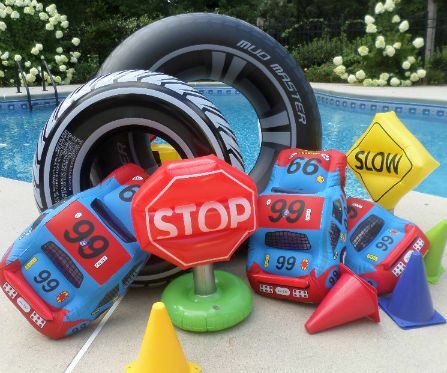 Floating stop signs, tire inner tube floats and traffic cones attracted more characters than just Lightening McQueen or Tow Mater. Boys and girls will love this themed pool party thanks to some great games in and out of the pool with splash bombs, scavenger hunt, and tire races. 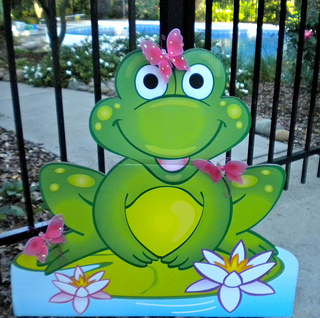 Girls and boys loved the fun pool party games for this Bullfrogs and Butterflies pool party. Not wanting the boys to find her party unexciting our granddaughter decided on this theme for her summer birthday pool party. Foam frog and butterfly visors were worn for the pool party parade as kids danced to the song, "Bullfrogs and Butterflies." Butterfly dive rings and hopping frog splash balls kept the kids entertained and in the pool. Lasso your favorite friends and round'em up for a fun time of Corralling the Horses and Sittin' in the Saddle. A bunch of cowboy hats and bandanas can turn any party area into the Wild West. 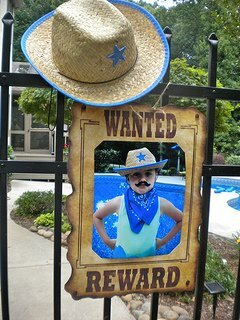 Start your western party decorations at the pool gate. Post a Reward Poster of the birthday boy/girl and hang it along with a cowboy hat. Hang vinyl red bandana pennants and red barn doors for the perfect photo op. A pirate pool party will have your guests diving for gold coins and other sunken treasures as well as Walking the Plank and Swabbing the Deck. Provide pirate eye patches for each guest along with a pirate hat and a plastic waterproof sword. We used foam pirate hats so that it didn't matter if they got wet. 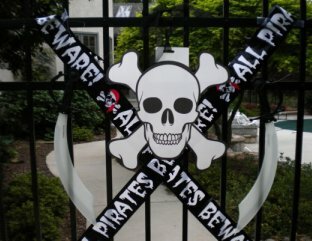 Pirate swords and skulls placed on the pool gate "warn" guests that they are entering pirate territory. Shark infested waters doesn't mean there is no swimming in the swimming pool! 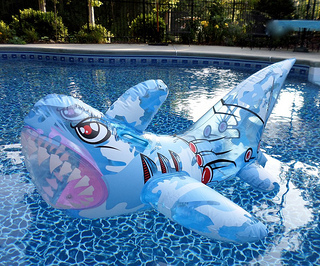 Swim with the sharks, but don't get attacked with this pool party theme. 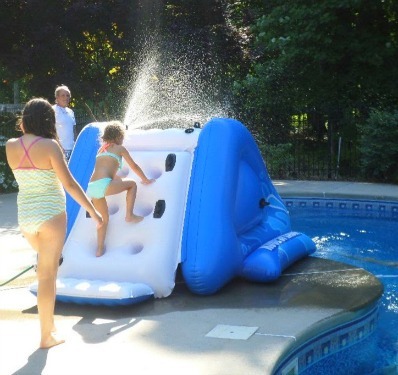 Get ideas for lots of pool party games with inflatable sharks, splash bombs and Max Liquidator water guns! A Lion King Parade to the Disney song, "I Can't Wait to be King," followed by a Lion's Leap into the pool made this party a "roaring" good time. Lion visors and lion beach balls kept kids entertained and acting a bit "wild." 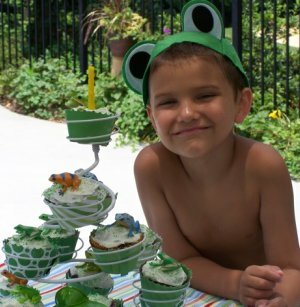 This little guy loved his Frog Birthday Party. The frog hat was worn for almost the entire party - in and out of the pool. Who wouldn't have fun doing the Lily Pad Leap, diving for frogs (some of them real) and eating frog birthday cake. Ladybug beach balls and splash bombs provide fun in the water and cupcakes and party bags out of the water. The contrasting deep red and bold black colors are repeated in the invites, paper goods and party bags. 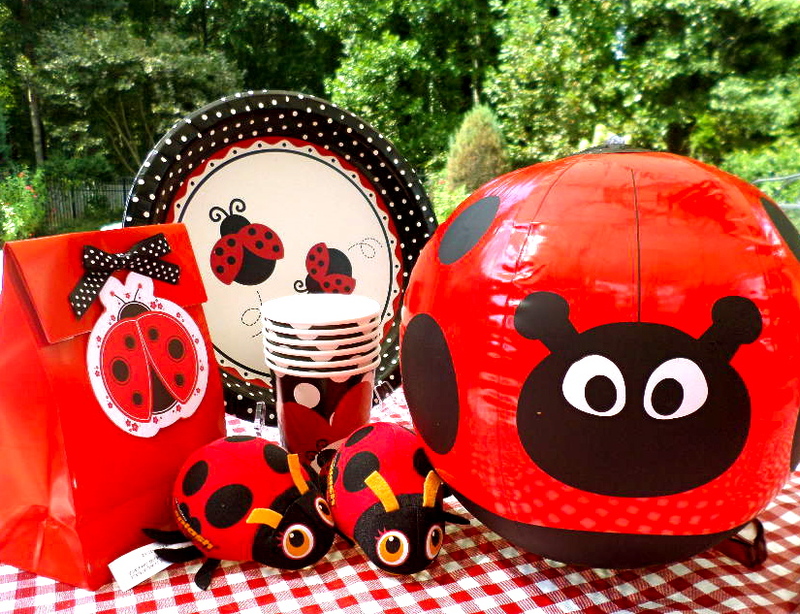 See how you can turn red nylon hanging lanterns into ladybugs, make a cute foam visor craft idea, and race with inflatable ladybugs. Who wouldn't want to celebrate with Minnie? Here she is greeting her guests right at the pool gate. 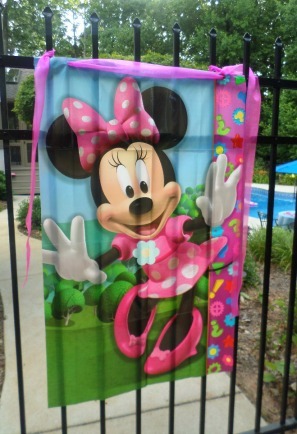 Minnie beach balls, floats and kickboards are waiting for kids in the pool. A scavenger hunt using pink, purple and yellow Easter eggs have kids searching the pool perimeter. Paper lanterns with ears hang from the umbrella poles and pink and white polka dot gift bags decorate the party tables. Even Minnie will kick off her pink shoes and polka dot hair bow to join in the fun. I believe in fairies! You would too if you had been at our fairy birthday party. Decorate with lots of fairy wings. 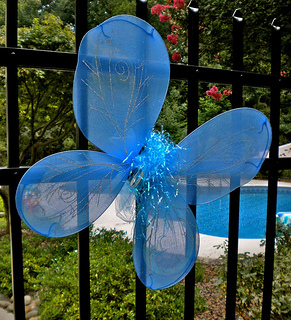 Tie them to the pool gate, hang them from tree branches or patio umbrella ribs, and use them for your centerpiece. Sprinkle pixie dust on the sidewalk leading to the party area and have extra to sprinkle on little girls who earn their fairy wings. With two pre-school granddaughters who love the Little Mermaid, I know first hand what a big hit this themed pool party provides. Have fun with the Trinket Dive and Under the Sea games and party favors. Our two little granddaughters helped to plan this summer's Little Mermaid party - starting with the Mermaid Parade to the Disney song, "Under the Sea." Fish were painted and hung from the patio umbrella and Ariel adorned the cupcakes. Mermaid games, like "Poor Unfortunate Souls" and Little Mermaid party supplies made the party a big hit. Kids went home with inexpensive goodie bags made from sea blue lunch bags decorated with foam stickers of sea waves and crabs, and tropical fish. 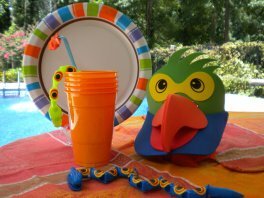 With inflatable colorful monkey's for decorations and to play with in the pool and monkey swim rings, a monkey birthday party makes for a great kids pool party. Serve frozen bananas on a stick for a "cool treat." Pick a color scheme of lime green and chocolate brown or bright pink and neon green. Floating fish beach balls decorate the swimming pool ready to be used for lots of fun pool games. Use them as take home party favors as well. 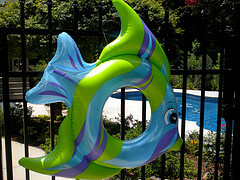 Fish shaped swim rings adorn the pool gate and extra ones are used for pool party games. 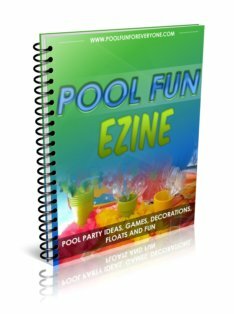 Pool birthday party ideas using inflatable pool slides, fun pool floats and cool pool toys make for a memorable time with friends, neighbors and family. 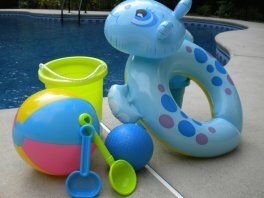 Fun floats and exciting dive toys add a fresh excitement to an afternoon at the pool. Turn a swimming pool noodle into a monkey and a parrot to see who can swim to the other side of the pool the fastest. Rescue an innocent rubber duckie from a swarm of snakes or just enjoy playing with a lion shaped beach ball. 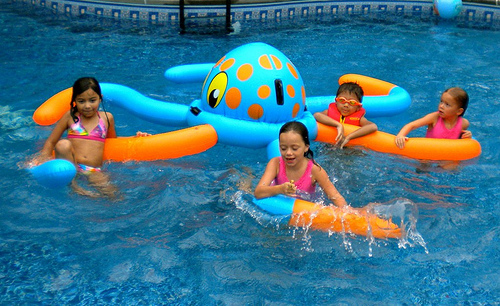 A few inexpensive pool toys can keep kids busy and entertained without much effort.